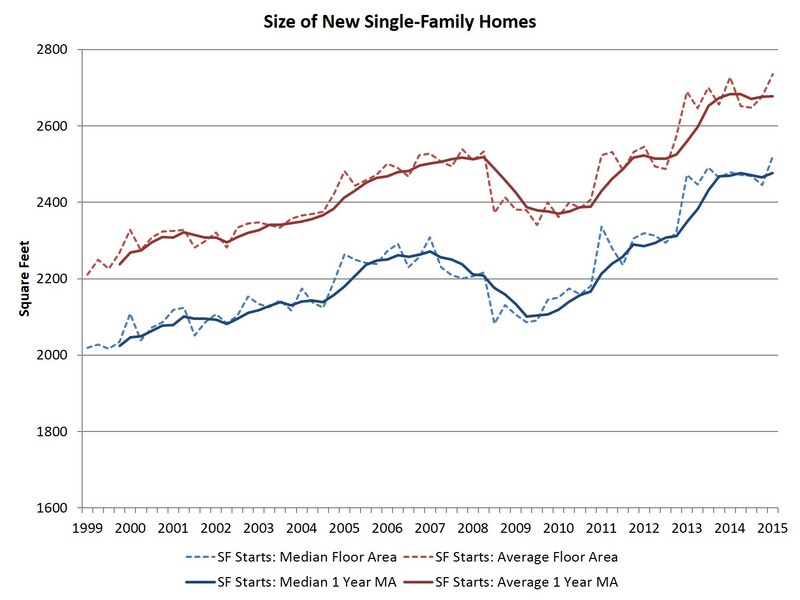 The typical size of newly built single-family homes increased at the start of the year. The trend of increasing new home size leveled off in 2014, but new home size increased during the first quarter of 2015 with a decline in the volume of construction. As first-time buyers return to the market, typical home size is expected to trend lower. According to first quarter 2015 data from the Census Quarterly Starts and Completions by Purpose and Design and NAHB analysis, median single-family square floor area increased from 2,445 in the fourth quarter of last year to 2,521 square feet. Average (mean) square footage for new single-family homes increased from 2,677 to 2,736 for the first three months of the year. On a less volatile one-year moving average, the recent trend of leveling home size can be see on the graph above, although current sizes remain elevated. Since cycle lows and on a one-year moving average basis, the average size of new single-family homes has increased 13% to 2,678 square feet, while the median size has increased 18% to 2,477 square feet. The post-recession increase in single-family home size is consistent with the historical pattern coming out of recessions. Typical home size falls prior to and during a recession as some homebuyers cut back, and then sizes rise as high-end homebuyers, who face fewer credit constraints, return to the housing market in relatively greater proportions. This pattern has been exacerbated in the last two years due to market weakness among first-time homebuyers. In contrast to single-family patterns, new multifamily apartment size is down compared to the pre-recession period. This is due to the weak for-sale multifamily market.